This festive season the offers on food have been raining; from fast food to food vouchers, the brands have come up with unique gifting ideas. It’s the experiences and moments that brighten up the festivals. As the brands roll out the festive offers, celebrations for both the companies and the consumers double up. What makes it more exciting is to know when the restaurants and your favourite food outlets coming up with quick and delectable gifting ideas. This festive season the offers on food have been raining; from fast food to food vouchers, the brands have come up with unique gifting ideas. “This is the time you can become a good and smart host in its place of serving the full carbs namkeen and sugary ladoos there is a whole new list of snacks that you can offer your guest this Diwali,” suggests Rueben Ghosh, Co-Founder and Culinary Director at Yumlane. When it comes to fast food, Pizzas are everyone’s favourite. Yumlane offers small yet scrumptious square pizzas where you can treat your guests without worrying on the budget. The square pizzas by Yumlane range from Double Cheese Margarita Pizza, Paneer Tikka Pizza, Paneer Peri Pizza. Mexican Tango Pizza and are available at leading retail chains D-Mart, Big Bazaar in Mumbai, Pune, Hyderabad and Bengaluru, starting price being Rs. 79. These square pizzas are also available at Big Basket. PizzaExpress, another leading brand that is known for scrumptious pizzas, has introduced lip-smacking desserts for the festive season. The desserts Chocolate Fudge Cake, Cheesecakes and Dough Balls with Nutella will certainly leave you craving for more. The moist, rich chocolate cake with chocolate fudge icing is simply palatable. It is baked fresh every morning and served with mascarpone to entice the taste buds. PizzaExpress’s famous Dough Balls, crisp from outside and soft from inside, served with Nutella Chocolate Dip make for a truly delectable dessert and gives a melt-in-mouth experience. The Chocolate Cheesecake, a soft, smooth-textured cheesecake with a layer of chocolate ganache, is simply irresistible. The vanilla cheesecake is served with mascarpone and is homemade. Barbeque Nation has a unique gifting idea for your loved ones. It is promoting gift cards among its consumers with the theme “Dil Khol Ke Diwali”. Apart from the grand spread of buffet, Banjara Goldfinch in Mumbai by the MRG Group has arranged for specially-designed Chaat counters for its guests. It has also come up with certain Indian desserts to please the palettes of its guests this Diwali. 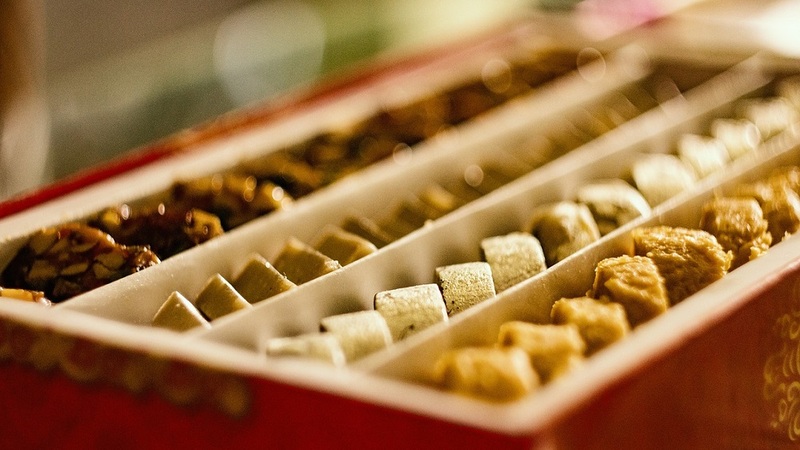 At the Banjara Goldfinch Mumbai, the guests could also buy Almond Rock Chocolates to gift their loved ones. Isn’t it a great gifting idea? Gurugram's Duty Free is no behind in offering a special menu this festive season. The Diwali special menu of Duty Free has Daulat ki Chaat, a magical concoction that involves milk and cream, DF Special Diwali Platter, which includes saffron pannacotta and payasam served with chikki and dry fruit jaggery burfi, Teen Patti, Bourbon whiskey flavoured with passion fruit purée, orange juice and sour mix topped with soda, and Eco-Friendly Duties which is turmeric-infused rum mixed with cardamom honey sour mix and egg white. The vegan restaurants are not behind in rolling out the offers on food as well designing special menu this festive season. Aishwarya Viswanath, who runs The Real Green Cafe in Pune, told the Restaurant India that she has designed a special menu for the festival. Without disclosing much, she wants the visitors to explore the festive menu designed especially for the vegans. Second Nature, the juice brand that believes in Farm-to-Home methods, is offering an exclusive range of nutritious cold-extracted HPP fruit and vegetable juices and creamy dairy-free nut milk. Revealing about the offers this festive season, Dipti Motiani, Founder and Chief Product Officer, Second Nature, said, “we are offering exclusive offers for our customers on the brand’s website. People can buy any six bottles of Second Nature Cold-Extracted HPP Juices for just Rs 599. We have 14 variants of the juices.” The fruits juices range from jamun-pomegranate, guava-agave-chilli, mango-almond-dates and more. “IG International is bringing an imported fruit basket to its patrons, which will be replete with scrumptious apples, pears, citrus fruits, avocados, blueberries and dragon fruit which they can either serve at their festive parties or gift to their loved ones,” told Tarun Arora, Director, Finance and Operations of IG International Pvt. Ltd. - the brand is India’s largest fresh-fruit importer. Speaking about the Diwali offers, Tarun said, “IG International has launched its unique Diwali offering to cater to health-conscious individuals who like to lay off the unhealthy sweets and junk food characteristic of the festive season.” IG international’s exotic fruit basket, starting at INR 650 will be available exclusively in Delhi and Mumbai. Customers, opting for the assorted basket for themselves or as a gift to their loved ones, will be able to choose the fruits to include in the basket according to their taste, preferences and budget. About Us: A Surat based waffle café named Waffle Republic. Serves..
Nurturing Students via Customized Intervention..
Jewellery Market Shines in Business World..
Say Bye to Vehicle Modification.. The Journey To Asia’s Biggest Brewery..
Premiumisation: Way Forward For Brands..
Tackling Breast Cancer with Innovations..
How to Set Up A Smoothie Bar Business.. Innovative Business Ideas for Indian Market.. Points to Keep in Mind, While Naming Business..
Lite Bite Foods Rolls out new Concept..